Anastopolo, George, Abraham Lincoln: A Constitutional Biography, (Rowan & Littlefield, 1999). Angle, Paul M., Where Lincoln Practiced Law, (Lincoln Centennial Association Papers, 1927). Angle, Paul M., Lincoln and the United States Supreme Court, (Lincoln Centennial Association Bulletin, May and June 1937). Davis, Cullom, Abraham Lincoln and the Golden Age of American Law, (Lincoln Fellowship of Wisconsin, 1994). Davis, Cullom and Martha Brenner, The Law Practice of Abraham Lincoln, computer disks, (University of Illinois Press, 2000). Farber, Daniel, Lincoln's Constitution, (University of Chicago Press, 2003). Frank, John P., Lincoln as a Lawyer, (University of Illinois Press, 1961). Hertz, Emanuel, Lincoln the Lawyer, (1937). Matthews, Lincoln as a Lawyer: An Annotated Bibliography, (Southern Illinois University Press, 1991). Neely, Jr., Mark E., The Fate of Liberty: Abraham Lincoln and Civil Liberties, (Oxford University Press, 1991). Pratt, Harry E., The Genesis of Lincoln the Lawyer, Part I and Part II, (Lincoln Centennial Association Bulletin, September 1939). Steiner, Mark E, Lincoln's Continuing Legal Education, (Lincoln Herald, Spring 1993). Steiner, Mark E., The Lawyer as Peacemaker: Law and Community in Abraham Lincoln's Slander Cases, (Journal of the Abraham Lincoln Association, Summer 1995). Thomas, Benjamin P., Lincoln and the Courts, 1854-1861, ( Lincoln Centennial Association Papers, 1933). 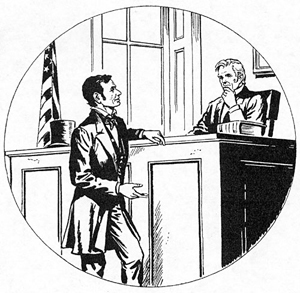 Thomas, Benjamin P., Lincoln's Earlier Practice in the Federal Courts 1939-1854, (Lincoln Centennial Association Bulletin, June 1935.). Townsend, William H., Lincoln the Litigant, (Lawbook Exchange, 2000). Zane, John Maxcy, Lincoln, The Constitutional Lawyer, (The Lawbook Exchange, 2002). Zane, John M., Lincoln, the Constitutional Lawyer, (Lincoln Centennial Association Papers, 1932). Bannister, Dan W., Lincoln and the Common Law, (Springfield: Human Services Press, 1992). Billings. Jr., Roger D. , A. Lincoln, Debtor-Creditor Lawyer, (Journal of Illinois History, Summer 2005). Fletcher, George P., Our Secret Constitution: How Lincoln Redefined American Democracy, (Oxford University Press, 2001). Stowell, Daniel W., In Tender Consideration: Women, Families and the Law in Abraham Lincoln's Illinois, (University of Illinois Press, 2002). Temple, Wayne C., Gov. Richard Yates and Pres. Lincoln, (Lincoln Herald, Winter 1968). The law also provided political as well as legal associations. Legal scholar Mark E. Steiner wrote: “Lincoln was a Whig before he was a lawyer, and his law practice paralleled his affiliation with the Whig party from the time he was first licensed to practice until 1855. Lincoln shared the Whig enthusiasm for market capitalism and endorsed Whig programs of internal improvements and tariffs that would encourage economic development.” Steiner noted: “The Whig Party attracted lawyers because of the congruence between the Whig commitment to order and tradition and the lawyers’ attachment to order and precedent.” 22 Understandably, Mr. Lincoln’s closest associates were not only lawyers but who were also Whig politicians who became Republican leaders men like William H. Herndon, David Davis, Leonard Swett, Henry Clay Whitney, Stephen T. Logan, etc. Law and politics were closely intertwined for Mr. Lincoln. If mediation failed, where Mr. Lincoln excelled was in his understanding of the way juries would react to him and to the evidence. Attorney Lawrence Weldon wrote: “Mr. Lincoln’s speeches to the jury were most effective specimens of forensic oratory. He talked the vocabulary of the people, and the jury understood every point he made and every thought he uttered. He never made display for mere display, but his imagination was simple and pure in the richest gems of true eloquence. He constructed short sentences of small words, and ever wearied the mind with mazes of elaboration.” 41 In the courtroom, argued Springfield court official Thomas W. Kidd, “His stories always had a point – he used them for a purpose, and learned to use them because he could accomplish in a few minutes by one of his inimitable stories what would have exhausted hours to clear away by argumentative appliances.42 One Illinois friend recalled a story his father told him about trial in which “Practically the whole affair hinged on the testimony of a celebrated surgeon. The occasion for his merriment was not very funny, but it was to the point. He apologised to the court for his seemingly rude behavior and explained that the damages as claimed was at first written $1,000. He supposed the plaintiff afterwards had taken a second look at the colonel’s pile and had thereupon concluded that the wounds to his honor were worth $10,000. “The leading rule for the lawyer, as for the man, of every calling, is diligence. Leave nothing for to-morrow, which can be done to-day. Never let your correspondence fall behind. Whatever piece of business you have in hand, before stopping, do all the labor pertaining to it which can then be done. When you bring a common-law suit, if you have the facts for doing so, write the declaration at once. If a law point be involved, examine the books, and note the authority you rely on, upon the declaration itself, where you are sure to find it when wanted. The same of defenses and pleas. In business not likely to be litigated – ordinary collection cases, foreclosures, partitions, and the like, make all examinations of titles, and note them, and even draft orders and decrees in advance. This course has a triple advantage; it avoids omissions and neglect, saves your labor, when once done; performs the labor out of court when you have leisure, rather than in court, when you have not. Extemporaneous speaking should be practiced and cultivated. It is the lawyer’s avenue to the public. However able and faithful he may be in other respects, people are slow to bring him business, if he cannot make a speech. And yet there is not a more fatal error to young lawyers, than relying too much on speech-making. If any one, upon his rare powers of speaking, shall claim exemption from the drudgery of the law, his case is a failure in advance. Discourage litigation. Persuade your neighbors to compromise whenever you can. Point out to them how the nominal winner is often a real loser – in fees, and expenses, and waste of time. As a peace-maker the lawyer has a superior opportunity [sic] of being a good man. There will still be business enough. Never stir up litigation. A worse man can scarcely be found than one who does this. Who can be more nearly a fiend than he who habitually overhauls the Register of deeds, in search of defects in titles, whereon to stir up strife, and put money in his pocket? A moral tone ought to be infused into the profession, which should drive such men out of it. The matter of fees is important far beyond the mere question of bread and butter involved. Properly attended to fuller justice is done to both lawyer and client. An exorbitant fee should never be claimed. As a general rule, never take your whole fee in advance, nor any more than a small retainer. When fully paid before hand, you are more than a common mortal if you can feel the same interest in the case, as if something was still in prospect for you, as well as for your client. And when you lack interest in the case, the job will very likely lack skill and diligence in the performance. Settle the amount of fee, and take a note in advance. Then you will feel that you are working for something, and you are sure to do your work faithfully and well. Never sell a fee-note at least, not before the consideration service is performed. It leads to negligence and dishonesty in refusing to refund, when you have allowed the consideration to fail. Cullom Davis wrote: “By 1860 Lincoln was celebrated and admired among his 2,700 Illinois peers, who deferred to him and also referred much work to him. His star standing even spread to neighboring states, where he took several consequential cases.”59 In Lincoln as a Lawyer, John P. Frank wrote: “Lincoln was gifted with extraordinary skill in the organization of materials. However, he was, not, in the legal sense, creative. He was a user of the existing structure of legal ideas rather than an innovator. The great demand on the top lawyers of the mid-nineteenth century was the development of new legal structures for expanding capitalism. Lincoln not only had nothing to do with this movement but, even in the fields of litigation and procedure, he also worked at perfecting established ways rather than at creating new ones.”60 Nevertheless, the legal work Mr. Lincoln did admirably prepared him for the political world of the presidency. Mark E. Steiner is associate professor of law at South Texas College of Law. His J.D. and his Ph.D. in history were earned at the University of Houston. Brian Dirck previously wrote Lincoln and Davis: Imagining America, 1809-1865 and edited Lincoln Emancipated: The President And the Politics of Race. He is an associate professor of history at Anderson University in Indiana and received his PhD from the University of Kansas. Roy P. Basler, editor, Collected Works of Abraham Lincoln,Volume I, p. 112, 115. (Speech to Young Men’s Lyceum, January 27, 1838). Jesse W. Weik, The Real Lincoln: A Portrait, pp. 140-141. Brian Dirck, Lincoln the Lawyer, p. 165. Brian Dirck, Lincoln the Lawyer. Michael Burlingame, editor, An Oral History of Abraham Lincoln, John G. Nicolay’s Interviews and Essays, p. 37. Michael Burlingame, editor, An Oral History of Abraham Lincoln, John G. Nicolay’s Interviews and Essays, p. 38. Mark E. Steiner, An Honest Calling: The Law Practice of Abraham Lincoln, pp. 40-41. William H. Herndon and Jesse W. Weik, Herndon’s Life of Lincoln, pp. 271-272. John J. Duff, A. Lincoln: Prairie Lawyer, p. 94. Henry Clay Whitney, Life on the Circuit with Lincoln, p. 409. Cullom Davis, Abraham Lincoln and the Gold Age of American Law, p. 8. Lawrence Weldon, Abraham Lincoln: Tributes from His Associates,(“Reminiscences of Lincoln as a Lawyer”), p. 240. Brian Dirck, Lincoln the Lawyer, p. 53. Charles B. Strozier, “The Lives of William Herndon,” Journal of the Abraham Lincoln Association, Winter 1993, pp. 9-10. Brian Dirck, Lincoln the Lawyer, p. 31. David Herbert Donald, “We Are Lincoln Men” Abraham Lincoln and His Friends, p. 75. Charles B. Strozier, “The Lives of William Herndon,” Journal of the Abraham Lincoln Association, Winter 1993, p. 2. Henry Clay Whitney, Life on the Circuit with Lincoln, p. 405. I. M. Short, Abraham Lincoln: Early Days in Illinois: Reminiscences of Different Persons who Became Eminent in American History, p. 57. Cullom Davis, Abraham Lincoln and the Gold Age of American Law, p. 9. Mark E. Steiner, An Honest Calling: The Law Practice of Abraham Lincoln, p. 56. Mark E. Steiner, An Honest Calling: The Law Practice of Abraham Lincoln, p. 74. Rufus Wilson Rockwell, editor, Lincoln Among His Friends, p. 107 (James C. Conkling, Chicago Bar Association, January 12, 1881). Rufus Rockwell Wilson, editor, Intimate Memories of Lincoln, p. 69. (David Davis, Address to Indianapolis Bar Association, May 19, 1865). Douglas L. Wilson and Rodney O. Davis, editors, Herndon’s Informants, p. 469 (A. F. Lord interview with William H. Herndon), ca. 1865-1866). Douglas L. Wilson and Rodney O. Davis, editors, Herndon’s Informants, p. 732 (Henry C. Whitney interview with Jesse W. Weik , ca. 1887-1889). Rufus Rockwell Wilson, editor, Intimate Memories of Lincoln, p. 319(George Hartley, Chicago News, January 28, 1909),. Don E. and Virginia E. Fehrenbacher, editors, Recollected Words of Abraham Lincoln, p. 330. Cullom Davis, Abraham Lincoln and the Gold Age of American Law, p. 9, 12. Allen C. Guelzo, Abraham Lincoln: Redeemer President, p. 84. Abraham Lincoln: Tributes from His Associates, (Lawrence Weldon, Reminiscences of Lincoln as a Lawyer), pp. 240-241. Mark E. Steiner, An Honest Calling: The Law Practice of Abraham Lincoln, p. 160. Mark E. Steiner, An Honest Calling: The Law Practice of Abraham Lincoln, p. 137. Oliver Fraysse, Lincoln, Land and Labor, p. 161. Rufus Rockwell Wilson, editor, Intimate Memories of Lincoln , p. 70 (David DavisIndianapolis Daily State Sentinel, May 20, 1865). Mark E. Steiner, An Honest Calling: The Law Practice of Abraham Lincoln, p. 75. Mark E. Steiner, An Honest Calling: The Law Practice of Abraham Lincoln, p. 84. Abraham Lincoln: Tributes from His Associates, (Lawrence Weldon, “Reminiscences of Lincoln as a Lawyer”), p. 241. Rufus Rockwell Wilson, editor, Intimate Memories of Lincoln,(Thomas W. S. Kidd, Bar Association of Sangamon County), April 25, 1893, p. 94. Rufus Wilson Rockwell, editor, Lincoln Among His Friends(Thomas Hall Shastid, Nation), February 20, 1929, p. 68. Rufus Rockwell Wilson, editor, Intimate Memories of Lincoln,(Abram Bergen, Kansas State Bar Association), 1897, pp. 76-77. Brian Dirck, Lincoln the Lawyer, pp.102-103. Rufus Rockwell Wilson, editor, Intimate Memories of Lincoln,(Thomas W. S. Kidd, Bar Association of Sangamon County), April 25, 1893, pp. 76-77. Rufus Rockwell Wilson, editor, Intimate Memories of Lincoln,(Thomas W. S. Kidd, Bar Association of Sangamon County) , April 25, 1893, p. 90. Rufus Rockwell Wilson, editor, Intimate Memories of Lincoln,(Abram Bergen, Kansas State Bar Association), 1897, pp. 73-74. Allan Nevins, The Emergence of Lincoln, Volume I, p. 356. Cullom Davis, Abraham Lincoln and the Gold Age of American Law, p. 13. Cullom Davis, Abraham Lincoln and the Gold Age of American Law, p. 12. Walter B. Stevens, A Reporter’s Lincoln, p. 32. Rufus Rockwell Wilson, editor, Intimate Memories of Lincoln,(Letter from William H. Somers to James R. B. Van Cleave), December 7, 1908, p. 76-77. Douglas L. Wilson and Rodney O. Davis, editors, Herndon’s Informants: Letters, Interviews and Statements about Abraham Lincoln,(Letter from Jesse W. Porter to Jesse W. Weik), January 14, 1887, p. 600. Allen Guelzo, Redeemer President , p. 161. Roy P. Basler, editor, Collected Works of Abraham Lincoln, First Supplement,(Notes for a Law Lecture), ca. July 1, 1850, pp. 18-20. Brian Dirck, Lincoln the Lawyer, pp. 4-5. Don E. and Virginia E. Fehrenbacher, editors, Recollected Words of Abraham Lincoln, p. 243. Cullom Davis, Abraham Lincoln and the Gold Age of American Law, p. 16. John P. Frank, Lincoln as a Lawyer, p. 96. Paul M. Angle, editor, Abraham Lincoln by Some Men who Knew Him, (James S. Ewing, speech to the Illinois Schoolmasters’ Club, Bloomington), February 12, 1909, p.39-40. John P. Frank, Lincoln as a Lawyer, p. 97-98. Brian Dirck, Lincoln the Lawyer, p. 169. Frank J. Williams, Judging Lincoln, p. 37.